Those of us who do our fair bit of reading will know that having light reflect off paper can be quite annoying. The Soft Light concept offers the reader with a luminescence which can be positioned according to the user’s needs. In addition, it can function as both an indoor or outdoor lighting, offering unprecedented flexibility to the user. The slim and flexible body allows a person to adjust its “neck” accordingly for optimal lighting. 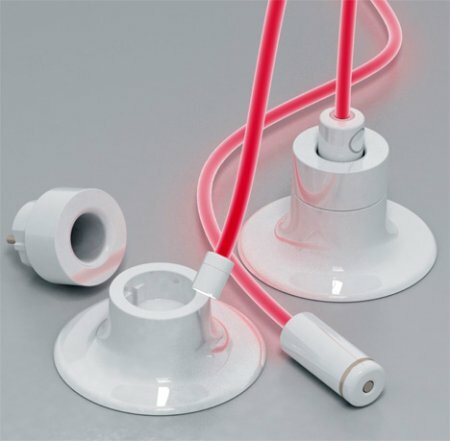 As for the lamp holder, it functions as a charger that helps juice up the lamp for outdoor use. Anyone wants to see this concept realized? Definitely would like this concept to be realized. I believe it would be much better than torch light as it is flexible and easy to carry around. It would be great with adjustable brightness.